WattHead - Energy News and Commentary: ATTN Matthew Wald at the NY Times: Does This Look Like "Environment-Friendly" Coal to You?! ATTN Matthew Wald at the NY Times: Does This Look Like "Environment-Friendly" Coal to You?! "Duke Energy has high hopes for this two-acre plot: If all goes right, and there is a happy convergence of technology, money and federal energy policy, the construction project could become the first environment-friendly coal-fired power plant in the nation." A coal plant that captures some (or even all) of its CO2 emissions is NOT "environment-friendly" by any stretch of the imagination. "Slightly-less-deadly," certainly. Maybe even "climate-friendly" if it captures most or all its emissions. But environmentally-friendly? Give me a break! If we took the coal industry at their word, and actually wanted to clean up coal, we've got to look far beyond what comes out of the smokestacks. Coal is currently dirty from beginning to end, and we have to clean up each stage of the dingy fuel's lifecycle to even approximate clean. Now, to be clear: I do not oppose research and demonstration of CCS technology. Given the scale of our global energy and climate challenge, I don't think we can afford to take the technology off the table before we even figure out if it'll work or if it'll open up a cost competitive option to accelerate the reduction of global greenhouse gas emissions. As long as CCS RD&D money doesn't come at the expense of full-scale investments in truly clean renewable energy technologies, I'm fine with a modest taxpayer investment in this technology. What I am VERY opposed to is journalists, politicians and industry PR hacks touting "clean coal" without getting serious about what that would entail! 1. 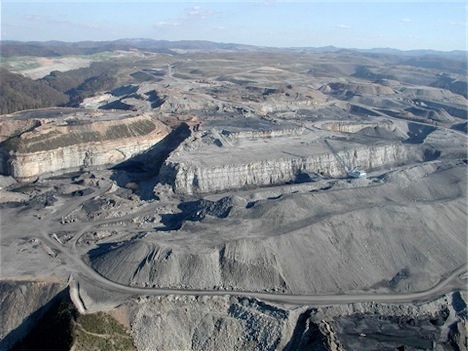 End mountaintop removal coal mining. How can we even start talking about "clean" coal when much of America's coal is mined by blowing the tops off of entire mountains and then dumping the rubble in streams and verdant valleys! That's about as far from "clean" as you can get, and the destructive and devastating practice should end immediately. The Clean Water Protection Act would reinstate real protections for streams and watersheds and ban the dumping of mountaintop removal rubble in these areas, a sensible step towards "cleaner" coal. 2. No new coal plants that do not capture and safely store their CO2 emissions. I'd say we start by requiring coal plants to emit less CO2 than efficient, combined cycle natural gas plants (that would require capturing and storing about 60% of their emissions) if they want to get an air permit. CA and WA have already implemented similar "emissions performance standards." Then phase up the requirement over time, to require 95%+ capture and storage before too long. After all, if new, high-tech coal plants that don't spew CO2 are right around the corner, we wouldn't to build any of those old-fashioned dirty plants then, right? 3. Require safe disposal of coal ash waste and slurry. After the devastating and massive coal sludge spill in Kingston, Tennessee just before Christmas 2008, we know too well that the dirty coal lifecycle doesn't end at the smokestacks. Even after coal is burned, we're left with billions of tons of coal ash and liquid coal slurry/sludge that must be stored and disposed of all across the country. The stuff is toxic, containing elevated levels of heavy metals like mercury and arsenic. And much of it is stored in the least safe-way you could imagine: in giant impoundment ponds of coal ash sludge and slurry, like the one that burst in Kingston, or the one that burst in Martin County, Kentucky in 2000, contaminating the water supplies of 27,000 residents, or worse-yet, the deadly spill in Logan County, West Virginia in 1972, which killed 125 people and injured over a thousand. If we're serious about "cleaning up" coal, it's time to require the safe disposal of coal ash in lined landfills, and launch a major effort to prevent future coal sludge disasters like the ones that have punctuated the history of the coal industry with far too much regularity. So, Mr. Wald, until we're well on our way to implementing all of these actions, don't talk to me about "clean coal" or "environment-friendly" coal. and let me know if you still think it is a good idea. I like your other positions on mountain-top removal and waste handling, but CCS is not a SUSTAINABLE idea.